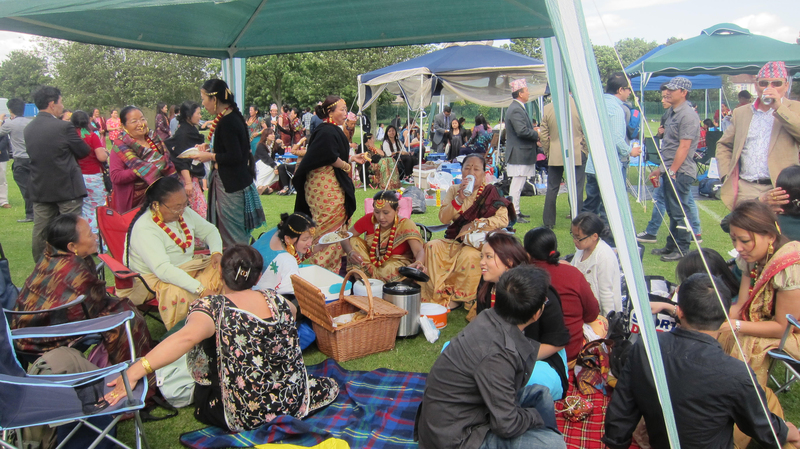 In this picture the Limbu people in the United Kingdom are seen celebrating their annual festival ‘Sisekpa Tongnan’. Nepalese are diverse in origins not only from the viewpoint of ethnic backgrounds but also in term of practicing religious traditions. In search of employment, the migration of Nepalese began since the early 19th century. Amid their struggles for survival in alien lands, Nepalese migrants are determined to preserve and promote their religious traditions in the diaspora. These Nepalese of different origins with diverse nationalities and religious stocks, though living far away from their motherland, are keen to give continuity to their religious, ritual, lingual and cultural practices that they learned in their homeland. In the recent past a large number of Limbus have migrated to various European countries, America, Hong Kong, Korea, Malaysia, and Singapore. 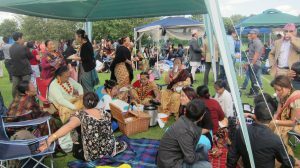 Most recently many Limbus have migrated to the UK, because the British government granted them residency rights as ex-Gurkhas. The Limbus in Nepal considers themselves to be the followers of Kirat religion. Traditionally the Limbus or the Kirats are nature worshippers as they worship rivers, rocks, trees, air, sky and earth, but not Hindu gods/goddesses.